ow our speaker that week is a gifted teacher! What a blessing that we have such women as part of our fellowship! Well, because I didn’t teach on this subject, I have really had to pray about what God would have me share here, not wanting to fail to address any of the Fruit of the Spirit in this online account. The Bible has so much to say about Love. Where in the world to begin? Considering I wrote this post, lost it, and had to re-write it, it may be a miracle that I have anything to share at all! 😉 But seriously, to read more posts from the Fruit of the Spirit series, you can visit the devotional index here. 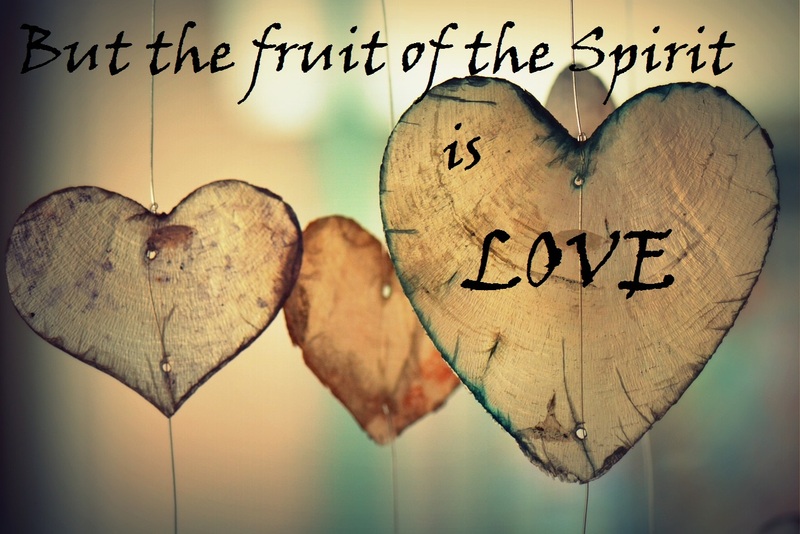 To live out the Fruit of the Spirit requires a decision; love is an act of the will. It’s during the most difficult seasons of our lives that we ourselves feel the need for love, and yet, it can be the most challenging time to show love toward others. Only God can fill us with this kind of love and enable us to give it away! Love is action, not just words. We are to back up our words with action. “Little children, let us not love in word or talk but in deed and in truth.” (1 John 3:18). Consider the people God has placed in your life for you to love. Love reaches out to the lovely and the unlovely alike. While God’s love is never deserved, it is for all of us. As such, God’s Spirit enables Believers to do what Jesus commands: “But to you who are listening I say: Love your enemies, do good to those who hate you,” Luke 6:27. He enables us to extend grace and love, unconditionally. We need God to help us love. Loving the unlovely bears witness to what God can do with a person’s life, and it brings Him glory. When we depend on God to love those who have hurt us, we bear His mark. Those who are hardest to love are often the ones who need it most. Love Expects Nothing in Return. In Luke 6:35-36, “ But love your enemies, and do good, and lend, expecting nothing in return, and your reward will be great, and you will be sons of the Most High, for he is kind to the ungrateful and the evil. Be merciful, even as your Father is merciful”. The nutshell version? If you want to know how to love, spend time with the expert. God is love. It’s one of the first things we teach our children about God, and they quickly memorize those three little words. If I wanted to share with you about the character of God, I might tell you that He is Good, Righteous, Just, Faithful, Merciful… and I could tell you that God is Loving (because He is), but again, that is His character. To say that God is love carries an entirely different meaning. It’s not just his character. It’s who He is, and without Him there would be no love. It’s pretty mind blowing. 1 John 4, verses 9 & 10, tells us that God showed us what true love was when He sent His son to be the atonement for our sin. The love of God was made “manifest” among us—Jesus, Emmanuel with us, so that we might have eternal life through Him. By reaching out and meeting our need for a Savior, God set the example for how we should love one another. 1 John 4:16 tell us: So we have come to know and to believe the love that God has for us. “God is love, and whoever abides in love abides in God, and God abides in him”. Verses 12-15 laid the ground work, by explaining that when we believe in this love God has for us because of the example He set, and put our trust in Jesus, we receive his Spirit. This is how abiding happens. This is how his love is made perfect in us; because His Spirit lives in us He fills us, and we can behave as He does. I have a plaque that says, “Children learn what they live,” and it is so true. Children who grow up seeing kindness modeled, show kindness. Those who experience generosity are eager to give. When adults model patience with their children, those children show patience toward their younger siblings. Those who experience comfort when they are hurt know how to give comfort. Unfortunately, the flip is true. Studies show that when children are not shown comfort, they do not know how to show comfort, and can be uncomfortable with it later in life. I have 8 children, from almost 2 all the way up to 19. I learned early on, sometimes to my humor and sometimes to my embarrassment, how well my small children mirror my attitudes and behaviors. If anyone was curious how I handled a 2 year old who misbehaved in the store, all they would have had to do is watch my first born little girl play with her doll and shopping cart. There it was–in perfect replay. There are times like today when the littlest one asked me for some chaga tea, and as I poured it into her cup she said, “Good job, good job,” in her almost two year old dialect. Children mirror the experiences we give them, and we as believers are Children of God. If we intentionally spend quality time with him, we’ll begin to mirror his character. The deeper we experience God’s love toward us, the more able we are to show the same love and compassion to others. There is such a thing, Tozer wrote, as having a right opinion about God, but lacking the heart and attitude that He wants us to have toward Him. Tozer believed that too many people have been misled to believe that if they’ve found God, they no longer need to seek Him. As I read about how the churches in his day had replaced the simplicity of Christ with programs and activities that take up time and attention but don’t satisfy the longing of the heart for more of God, it’s hard to believe this book was written in the 50’s. It sounds like he’s describing churches today: too much busy and not enough relationship. God is always here with us, no matter where in the world HERE is to you and to me. He is everywhere. Yet He is still MANIFEST, Tozer taught, when we are aware of his presence, and when we surrender and cooperate with his will in our lives. Spiritual responsiveness is the uncommon road. It is increased by exercise and decreased by neglect. It’s when we neglect to pursue God that we fall off the path. It happens far too easily. Our passion for God can never be any greater than the fire He kindles in our spirit. His Spirit has to draw us and enlighten us about who He is. However, it’s our decision to reciprocate God’s desire for us to pursue Him that fans the flames of that fire. We have to make the decision to follow after Him. Have you heard the expression, “To know me is to love me”? Ask Him to draw you; ask Him to kindle an ever greater passion for Him in your spirit. Ask Him to sit with you and enlighten you about who He is. Deliberately pursue Him. The more you come to know Him, the more you will grow to love Him. His character, His fruit of the Spirit will flower in your life, and you will grow to love what He loves more each day. There’s not a one of us who has arrived. In our humanity we fall down. Sometimes we take a step backward, but lets get up and move forward again. Someday we’ll be face to face with our Savior, and we will be completely and perfectly transformed into His likeness, truly! It’s called glorification. Until then, our help is in Him, and the glory is, really~one day at a time~ in the becoming.